It's time to get the tent packed up and the wellies out as festival season is well and truly in full swing. Running since 1999, the annual Leeds Festival is regarded as one of the leaders of the pack in UK festival land and these days attracts over 75,000 revellers to its home in Bramham Park. Over the years it’s boasted headliners like The Prodigy, The Chemical Brothers and Chase & Status, plus rock royalty like Red Hot Chili Peppers and Metallica. For the electronic music heads it's the Relentless Energy Stage that has become the place to be once the main stages come to a close. 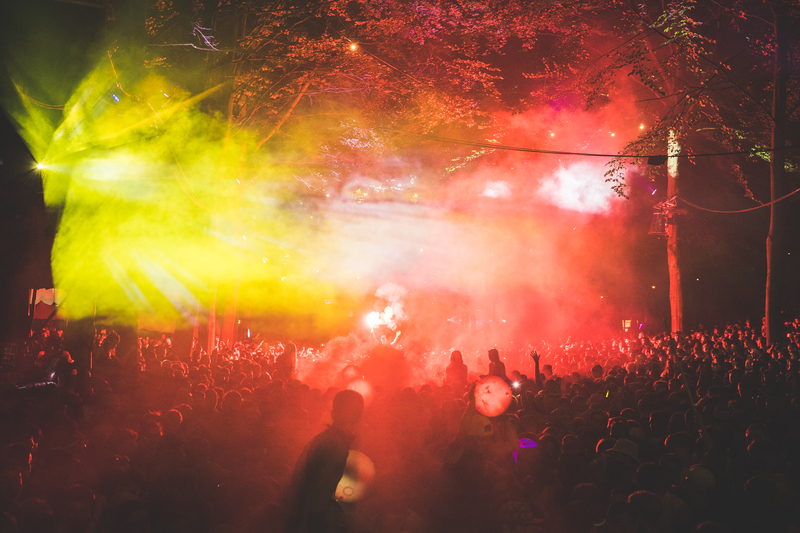 It's nestled deep in the woodland and runs from 8pm until 3am in the morning; with state of the art projection mapping and lasers it's a truly unique spectacle once the sun goes down. Every evening around 14,000 ravers gather at the stage and the energy of the nighttime crowd is unrivalled. 2017 saw the likes of Mistajam, Solardo, Jackmaster, and Wilkinson plus support from Butch, Theo Kottis, Nyra, Rude Kid and more take to the stage. Now into its fifth year of programming, it could in fact be your name amongst the stars. We're proud to announce that DJ Mag have joined forces with Relentless Energy to offer three readers the chance to play to the masses by winning a highly coveted set on the Relentless Energy stage. There will be slots for three budding DJs to play Friday, Saturday and Sunday over the course of the weekend. Already announced to play this years festival are acts including Bicep (live), Kölsch, Hannah Wants, DJ Target, Annie Mac, My Nu Leng and The Magician so you'll be amongst great company. Three key industry figures have been brought together to judge the talent and find the suitable winners: DJ Mag's very own Editor Carl Loben, Defected Records Managing Director Wez Saunders, and Director of Music at Monster Europe James Sutcliffe. Not only will you be sharing the bill with the cream of the crop in dance music, each winner will receive personalised headphones from V-MODA, a UDG creator backpack and an online music production course courtesy of Point Bank in London. The custom-built V-MODA Crossfade 2 Wireless range of headphones can be used with Bluetooth technology or wired mode for maximum versatility, pure analog and zero latency. They also come with bespoke 3-D shields so you'll be sure to stand out from the crowd. UDG is a brand that's become the essential purchase for any DJ on the road; the Ultimate DIGI Backpack is one of their latest and most desirable travel accessories from the range. Made to fit laptops and DJ controllers, including models like the Ableton APC 20, there's also a space to fit some choice vinyl cuts in there too. Alongside the top quality kit you'll be commandeering, winners will also earn a course at Point Blank's award winning music school. You'll be able to pick from two of their most popular courses: Complete Ableton Live, which will take you to an advanced level of the production programme, or Complete Electronic Music Composition, specialising in the basics of music theory. Each course is worth £1,200 each and available online so you can log in and complete anywhere in the world. Now that's a pretty desirable prize package we'd say! So do you think you've got what it takes? We're looking for a talented DJ ready for their big break, with a defined sound that will work well on the Relentless Energy Stage. You'll need to know how to mix on CDJs or turntables, and production/studio experience would be beneficial. Many DJs could only ever dream of playing to such a renowned, up-for-it festival crowd, so it'll be a great leg-up for aspiring stars. If you'd like to enter, it's time to tighten up your tune selections and pull your mixing skills out the bag and send us your best recorded mix (maximum 30 minutes long). Alongside the prizes, travel and accommodation is also covered; just make sure you're available to head to Leeds 23rd to 27th August 2018. The competition runs from 1st June to 28th June so don't delay, head to djmag.com/relentlessenergy to enter!